The popularity of online gambling is at the seams, and there are many online gambling companies that are cropping up day and night. This has made it very hard for people to identify which of the companies are scam, and which ones actually work. In this article, we intend to make it easier for people to choose a betting company that they can trust and benefit from, and that is why we are going to review the Casino Kingdom. Opened in 2002, Casino Kingdom has been around for over 15 years now. Owned by Technology Services Trading Ltd, it is fully powered by Microgaming, which is licensed by the Kahnawake Gaming Commission in Canada. Casino Kingdom offers a thrilling online gaming experience and forms part of the Casino Rewards group. The best in gaming, Bonuses and customer support can be found at this superb online casino. Casino Kingdom offers its players a 100% Deposit Bonus of up to $/£/€ 77 on the 1st deposits. In addition, first-time depositors get up to 100 Free Spins, which is ideal if for those who are still learning. The free spins have a very low wagering conditions, and they are available in new slots. 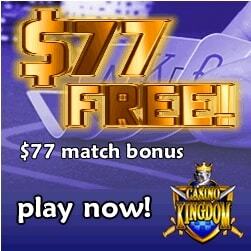 For example, upload $77 to your account and you will play with $154 free chips. To claim this offer you will have to create your Real Money account and play via any web browser or download version (client). There is no difference when you play on download version of the casino, but it works a bit faster and has no lags. Casino Kingdom is powered by Microgaming™ technology, which means players are guaranteed an impressive collection of over 650 top-notch games. Games such as Blackjack, Roulette, Baccarat, Craps, Video Poker, Video Slots and many more can be found in the casino lobby. Furthermore, all the games uses a reutable RNG tool for randomization purpouse that in turn assures honest payouts. Besides, the casino offers all the biggest progressive jackpots out there. To be more specific, it has 16 jackpot titles, including ever-popular Mega Moolah, Major Millions, and Cash Splash. There is never too late to playa win over $1,000,000 in a single spin. Other than that, we can recommend trying some table games and video pokers, eg. Jacks or Better, Multi-Hand Atlantic City Blackjack Gold, VIP Roulette, and Highroller Blackjack. Casino Kingdom supports all Android, Blackberry, and iOS devices and offers the same great experience players will get in desktop mode. For example, players can access the casino via iPad, Windows Phone, Samsung Galaxy, and iPhone, etc. A vast array of internationally recognized banking methods are available to players who want to make any withdrawals and Deposits, which include but are not limited to MasterCard, VISA, NETeller, Click2Pay and direct bank transfers. The minimum deposit is $20 or equivalent in other currencies. Players who decide to play for money, they can select their currency from USD, CAD, EUR, and GBP. Player information and transactions are guarded by 128-bit encryption technology to ensure a safe and secure online banking environment. Casino Kingdom is approved by eCOGRA and fully licensed by the Malta Gaming Authority (MGA). Players can easily get in touch with Casino Kingdom’s Contact Centre via Email ([email protected]), Live Chat or the toll-free telephone numbers. The multilingual operators are available 24/7 to assist with any queries or issues. The casino website is currently available in two languages: English and Danish. There are also some rumors that other languages will be added soon.